The deadlift is one of the top two exercises to perform, in my opinion. It is a natural, functional movement that gives us so many benefits to our health. Whether your goal is to build mass and size, tone up, gain strength, or for general fitness and flexibility, this is a must for any program. You just have to manipulate the finer details depending on which target you have. As a personal trainer, I make sure every plan I do contains this movement somewhere. The correct form for a deadlift is essential, so making sure you get this right is paramount before adding any weight or resistance to the movement. Keep your back straight at all times, do not arc, this is where you will get injuries, especially when lifting heavy. This is why I say to get correct form first, then add. With a barbell on the floor, keep your feet shoulder width apart and your toes just underneath the bar. Keeping your back straight, bend forward from the hips, with a slight bend in the knee. Grip the bar, typically with one hand prone, the other supine. Lift the bar up, drive through your heels as you do until you stand tall and your shoulders square. Repeat the process back down. If you are on an olympic pad, and are lifting seriously heavy weight, you may need to drop the bar to the floor from the standing position. 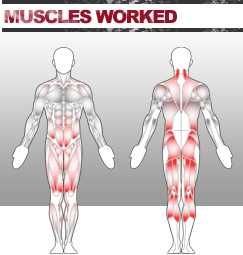 The muscles this exercise uses are incredible, nearly everyone in the body. It is a full body workout, so very time efficient too. There are some very important hormonal effects from performing a deadlift. Performing a deadlift with a heavy resistance will create a testosterone response that places your body in an anabolic environment. So you will repair and build those muscle fibres making you stronger. Ladies don’t panic, you are not going to end up looking like Arnie either, although women do produce testosterone, it is not in the amount that would be needed to build a ‘big’ physique. You will get ‘toned’ as opposed to ‘bulked’. Provided you are not using any outside influences that is?! For the guys though, you will get more benefit from building more muscle mass because you have this hormone more naturally abundant than our better looking counterparts. Here’s a little bonus to this though, the more muscle mass you have, the more fat you burn at rest. Try to keep your rest periods down to a minimum, don’t do your next set fatigued obviously, but the shorter the rest, the more growth hormone is released, which essentially means better recovery and guess what, increased fat loss. How can we not do this exercise? There are too many benefits to miss out on this. 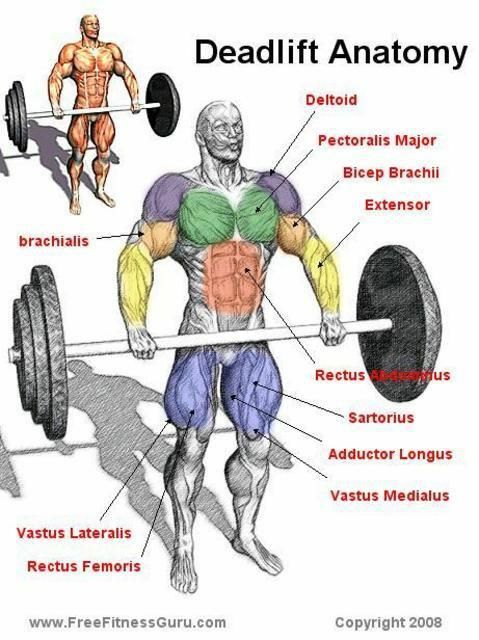 Above is a picture of the muscles worked by performing a deadlift. Not bad for one exercise eh?